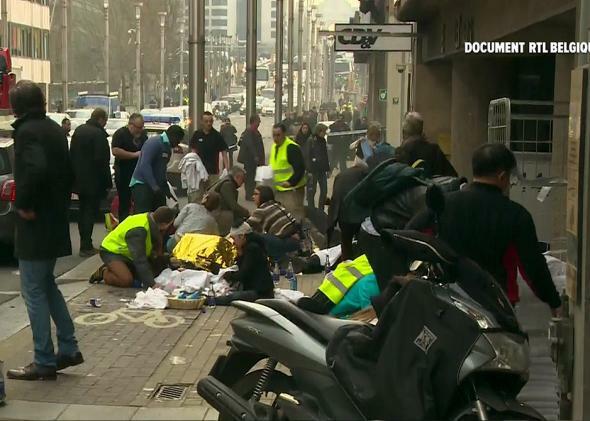 Rescue workers treat victims of Tuesday’s bombing at the Maelbeek underground station in Brussels. Here are some images from the aftermath of the attacks. Here’s why such a seemingly innoucuous country as Belgium is troubled by terrorism. President Obama called the disaster a reminder that the world’s citizens, “regardless of nationality or race or faith,” must unite against extremism. Ted Cruz announced that we need to “secure Muslim neighborhoods” in the U.S. but didn’t explain what that actually means. Infamous ex-Toronto mayor Rob Ford died at age 46; he’d been diagnosed with cancer in September 2014. Cruz and John Kasich are fighting over the anti-Trump vote in tonight’s primaries, which means the results will probably be good news for Trump. An unsettling preliminary finding about rising sea levels has been approved for publication after peer review. And Syrian refugees helped rescue a far-right anti-immigrant German politician after a car crash. Have a good night out there. Click here to sign up for Slate’s many life-alteringly brilliant newsletters.